From 2002 to April 2011 this site was run on the behalf of the Isle of Wight Ice Dance & Figure Skating Club. Updates were a bit sparse during 2009 owing to a family illness, with the result that the online history of skating on the IW is a bit patchy for that period. In July 2017 we welcomed the Isle of Wight Ice Dance & Figure Skating Club back on board to allow them to retain a web presence after the closure of their website: items specifically to do with the club are now viewable under the Club News tag. The contents of this website are copyright iowskaters and the respective authors. The site is largely the work of a journalist with a passion for ice skating and who wishes to support ice skaters on the Isle of Wight. Planet Ice (Arena Group) took a 125-year lease from the council in 1999 (but only signed the deal in February 2001), and announced it was pulling out of the rink in 2015. Planet Ice sold the lease in 2012 – according to Ryde Arena Trust and RACAG to MOF III and according to the IWCP to Margate Properties – and the rink was then sold on to investment company AEW for £1 million in October 2014, with Planet Ice taking a sub-lease as operator. Planet Ice had as part of its original lease from the council guaranteed to run the venue as an ice rink for 15 years, which from the time of signing the lease would have meant until February 2016. Planet Ice (Arena Group) twice tried and failed to redevelop the rink: in 2011 it revealed plans to redevelop the rink as a combined budget supermarket and ice rink. Its plans mooted in 2006 for a hotel, apartments and bigger ice pad on the site were turned down in 2007. Community action group Ryde Arena Trust was established in 2015 to try to secure the future of the rink. On Saturday 18 April 2015 it announced at the evening hockey match between Wightlink Raiders and Invicta Dynamos that the rink had been signed over to the trust at 10am. Storm damage to the rink in November 2015, however, closed the rink to the public until August 2016. On 6 October 2016 the bailiffs moved in as leaseholder AEW Europe/BNY Mellon shut out Ryde Arena staff, skaters and coaches. On 8 October 2016 the trust, Ryde Arena Limited, issued a statement that it was placed in a position where it could not operate the rink, in effect ending ice skating on the Isle of Wight. AEW Europe is currently seeking £3 million for the rink even though it has let the café and bar areas fall into disrepair and has accepted insurance payments for the storm damage. IW Council made the rink an Asset of Community Value in January 2017. Ryde Arena Community Action Group (RACAG) is seeking either the reopening of the existing rink or a new rink, and has targeted AEW Europe as part of its protests. The ice skating club was formed in 1993. The club is still active even though its home rink is shut: its active members are by and large members of the synchronized skating teams. iowskaters.com again became the web home of the club in June 2017; the club also maintains its own Facebook page. The Island’s first synchronized skating team made its debut in 2004, skating at the National Team Challenge. In 2005, the team qualified for the British championships, which were held in January 2006. In 2007 the Wight Diamonds synchro team took bronze at intermediate level at the British RJS Synchronized Skating Championships. The Diamonds took a national bronze for a second time in 2007, skating at Elementary level at the Scottish championships, Sk8Scotland. Interest in the discipline was such that the IW formed a second team, the Wight Gems, which took silver at the British RJS Opens, and a third team, the Wight Crystals. The Wight Diamonds became British synchronized skating champions at novice level at the British championships in January 2008, competing against Nottingham Shadows and Bracknell Fusion, and skating for the first time under the international judging system (IJS). The Wight Diamonds skated internationally for the first time in May 2008, coming second in their age group in the Olympiysky Sports Complex Cup, held in Moscow, again coming ahead of the Shadows in the overall competition. With members increasing in age and experience, the teams were reformed in 2008 to comprise the Wight Crystals (juvenile), Wight Diamonds (novice) and Wight Jewels (junior). The Jewels were the highest ability team, formed from the 2008 championship-winning Diamonds, with the Gems turning into the new Diamonds. In 2009 the teams were reformed again to reflect the abilities of skaters, to comprise the Wight Jewels (juniors), Wight Gems (preliminary) and Wight Crystals (juvenile). For the 2011/12 season the Wight Crystals moved up to compete at novice level; the Wight Gems retired, and a new team, Wight Sparkles, was formed. The Wight Jewels have been British junior synchronized skating champions four times in a row, most recently at the 2011/12 British figure skating championships in Sheffield in November 2011. In the 2012/13 championships they were second. They competed for the first time in the junior synchronized skating world championships, the Junior World Challenge Cup, in Gothenburg, Sweden, in March 2010, placing 19th in what was their first ISU international competition. They have since improved their placing at the JWCC, coming 17th in 2011 in Neuchatel, Switzerland, and 15th in Gothenburg, Sweden, in 2012: at that time, 15th place was the best result a British team had achieved at the JWCC in over 10 years. The Jewels took their first gold medal at an ISU international event in March 2013 at the Trophy D’Ecosse in Dumfries, Scotland, with a season’s best score of 98.63. It was also the highest score achieved by a British junior team at an ISU international in the 2012/13 season. 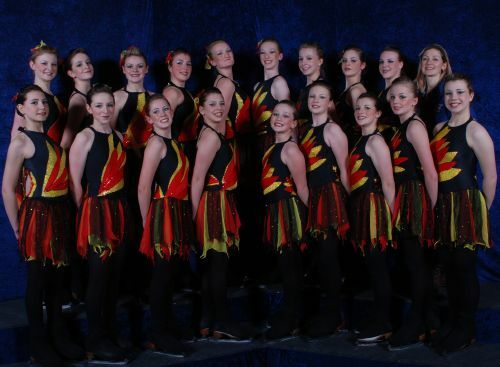 After recapturing the title of British juvenile champions in 2010/11, the Wight Crystals reformed as a novice level team for the 2011/12 season. They were bronze medallists at novice level at the 2011/12 British figure skating championships held in November 2011 in Sheffield. They took gold at the Trophy D’Ecosse in March 2013 in the basic novice event. In October 2010 the Wight Jewels competed for the first time in the Welsh Championships, winning the junior synchronized skating title. They retained the title at the 2011/12 event in October 2011. Wight Sparkles took the silver medal in the elementary category at the Trophy D’Ecosse in Dumfries in March 2013, improving on their bronze of the previous year. Wight Jewels moved up to senior level for the 2015/16 season. Despite the closure of their rink, the teams vowed to continue competing for the 2016/17 season, training on mainland ice rinks. The teams are again expected to compete during the 2017/18 season. The exception is the Wight Fossils, the adult team, which have called it a day. Head coach Terri Smith (nee Fleming) was named lady coach of the year for 2007 at the IW Sports Achievement Awards. The Wight Diamonds: British Novice Champions 2008. The Diamonds went on to form the Wight Jewels, who won the British Junior title in the 2008/9, 2009/10, 2010/11 and 2011/12 seasons.